ABS-CBNmobile adds yet another show to its growing roster of digital series with “Coffee Break,” a new sitcom for young audiences that marks the directorial debut of young actor Nash Aguas who also appears in the show. The show follows a group of friends as they talk about their lives, problems, and life lessons over coffee. 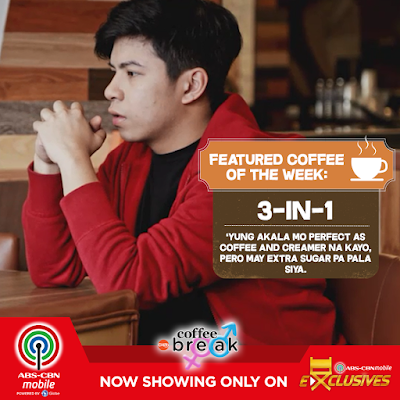 Most of the story is told from the point of the view of a barista, who plays witness to the barkada’s lives as they discuss their problems and bare their hearts in a coffee shop. The online show, which premiered this January, follows other ABS-CBNmobile exclusives launched last October. It features “The Good Son” cast member as both director and actor, along with some of his fellow “Goin Bulilit” graduates John Manalo and Igiboy Flores, as well as Star Magic Artists Claire Ruiz and Anne Tenorio. ABS-CBNmobile, the Kapamilya network’s own mobile service, began offering its subscribers a variety of original and exclusive for online shows last October as more and more Filipinos prefer to watch content on the internet and using their gadgets. These exclusives add to the increasing digital content being produced by ABS-CBN, which is rapidly transitioning into an agile digital company with a growing list of digital platforms and the biggest online presence among Filipino media companies. Aside from “Coffee Break,” viewers can watch shows like “Dear Alex” featuring Alex Gonzaga as she answers fans’ questions on love and life with her signature sense of humor, honesty, and personal experience, with the help of classic ABS-CBN series and Star Cinema movies. Meanwhile, “Squad Goals” featuring Maymay Entrata, Edward Barber, Marco Gallo, and Kisses Delavin as they tackle DIY activities and hacks to make life more creative. Celebrity fans will enjoy “Kikinangkinang Kasama si Kaladkaren” starring Karen Davila’s impersonator Kaladkaren, as she sits down with ABS-CBN stars and gets them to spill some secrets while doing outrageous challenges. Fans of the “Hashtags” can catch the viral dance group’s life behind the camera as they share their signature moves, and “Shookt” will give crime shows a run for their money as it tells some of the creepiest, scariest stories you won’t believe are true. To access ABS-CBNmobile Exclusives, ABS-CBNmobile users must have an active SIM with internet connection (3G or LTE). Subscribers can dial *128# and subscribe to KSURF promo loads to get value for their money. Watch ABS-CBNmobile Exclusives on the website via a smartphone, PC, laptop, or tablet. Visit www.abscbnmobile.com/exclusives to find out more and catch the shows at your convenience—while in-transit, on your lunch and coffee break, or even on vacation.